Love is in the air for a Valentine’s Day edition of the OHL This Week. Oshawa Generals forward Anthony Salinitri scored his 40th goal of the season in his 300th career regular season game on Wednesday, guiding his club was the Peterborough Petes 6-3 on the road. Salinitri has 46 points (26-20–46) over 30 games since joining the Generals and a total of 74 points (40-34–74) through 55 games in this, his fifth OHL season. The 20-year-old from Windsor, Ont. has a total of 239 points (120-119–239) including 20 power play goals and 14 shorthanded markers over his OHL regular season tenure. A sixth round pick of the Philadelphia Flyers in 2016, Salinitri attended rookie camp with the Vancouver Canucks last September. Sportsnet’s Sam Cosentino has assembled his monthly top-31 for the 2019 NHL Draft, a list that includes five OHL players led by Hamilton Bulldogs winger Arthur Kaliyev. 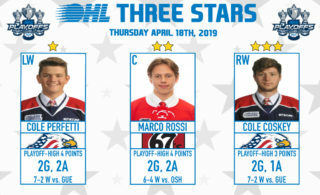 Mississauga Steelheads defenceman Thomas Harley, Barrie Colts forward Ryan Suzuki, London Knights forward Connor McMichael and Niagara IceDogs forward Philip Tomasino are also included. For the full list visit sportsnet.ca. Ratcliffe, Schnarr, Hawel and Merkley donate to McFadden’s Movement: A group of Guelph Storm teammates and a former Storm defenceman recently contributed to the cause of 2018 OHL Humanitarian of the Year Garrett McFadden as he continues to raise mental health awareness through “McFadden’s Movement.” Isaac Ratcliffe, Nate Schnarr and Liam Hawel banded together through a #BellLetsTalk fundraiser to donate a total of $1922 to McFadden’s cause. Peterborough Petes blueliner Ryan Merkley pitched in with an additional $650. For more information on McFadden’s Movement, visit mcfaddensmovement.com. Wolves suit up in Spiderman threads for Superhero Night on Friday: The Sudbury Wolves will don special Spiderman themed jerseys for Superhero Night when the Soo Greyhounds come to town on Friday. The club’s 4th annual Superhero Game is held in support of local children’s charities. Proceeds from an online jersey auction will be donated to the Northern Ontario Families of Children with Cancer (NOFCC). For more details visit sudburywolves.com. Storm hosts Pevs Protects Game on Friday: The Guelph Storm will host their 4th annual Pevs Protects Game on Friday when they play host to the Kitchener Rangers. The first 1,000 fans in attendance will receive a special Pevs Protects T-shirt. PEVS PROTECTS was developed by former National Hockey League forward and Guelph native Rich Peverley, and his family, in partnership with the Heart and Stroke foundation. The partnership aims to raise awareness and funds for AED purchases and CPR training right here in the City of Guelph. For full details visit guelphstorm.com. Firebirds host Flint Tropics Night on Saturday: It’s a night everyone looks forward to. The Flint Firebirds will be getting tropical on Saturday when the Owen Sound Attack visit for Flint Tropics Night. The 4th annual Tropics Night features specially themed jerseys that will be auctioned off and proceeds donated to the Flint Firebirds Charitable Foundation which benefits local youth organizations throughout Flint and Genesee County. 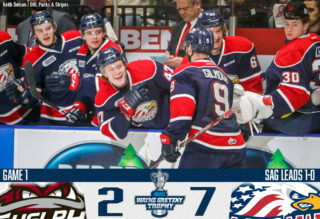 For a full rundown of Saturday’s event visit flintfirebirds.com. Bulldogs host Pride Night on Saturday: The Hamilton Bulldogs host their 2nd annual Pride Night on Saturday when they take on the Peterborough Petes. The event is held in support of the You Can Play initiative that supports equality for all in sports including LGBTQ athletes, coaches and fans. Storm to raise funds and awareness for individuals with an intellectual disability: The Guelph Storm, Law Enforcement Torch Run, Special Olympics Ontario and the Guelph Police are teaming up to raise awareness about the importance of individuals with an intellectual disability at Monday’s Storm game against the Flint Firebirds. The awareness campaign is part of the ongoing commitment by the Ontario Hockey League, Guelph Storm and LETR/Special Olympics Ontario to raise awareness and funds for Special Olympics Ontario. For full details visit guelphstorm.com. Sting charity Esports jerseys up for auction: The Sarnia Sting are currently auctioning their game worn ESports jerseys that they suited up in Sunday afternoon. Fans can get a hold of a unique piece of Sting history and support the Sarnia Sting Group of Charities in the process. To east your bid visit CHL Auctions. Thornton climbing NHL all-time lists: Sault Ste. Marie Greyhounds graduate Joe Thornton is on the rise in the NHL record books. Thornton reached a pair of milestones in Monday’s 7-2 win over the Vancouver Canucks, surpassing Gordie Howe for ninth on the NHL’s all-time assists list with 1,050 while also tying Teemu Selanne for 15th on the league’s all-time points list. He also passed Shane Doan and Johnny Bucyk for 15th on the league’s all-time games played list, suiting up in his 1,541st career game. The 39-year-old St. Thomas, Ont. native has 30 points (10-20–30) over 48 games this season. Thornton has been in the NHL since 1997 after he was the first overall pick of the 1997 NHL Draft by the Boston Bruins. Thornton is a former CHL Rookie of the Year and World Junior gold medalist who played two seasons with the Greyhounds from 1995-97. Binnington, Strome named NHL Stars of the Week: A pair of OHL graduates in Jordan Binnington and Dylan Strome have been named to the NHL’s Three Stars of the Week. 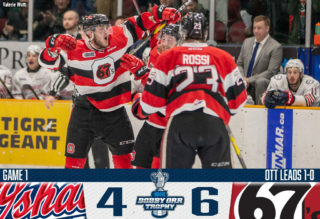 Owen Sound Attack grad Binnington was named first star and went 3-0-0 with a 1.31 goals-against average, .954 save percentage and one shutout to lift the Blues (27-22-5, 59 points) to their sixth straight win. Erie Otters alumni Strome was named third star collecting 2-5—7 in three contests to help the Blackhawks (23-24-9, 55 points) extend their overall winning streak to seven games and move within four points of the final playoff spot in the Western Conference. 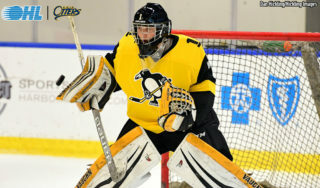 Binnington is a former OHL Goaltender of the Year who won an OHL Championship with Owen Sound in 2011. Strome is the leading scorer in Erie Otters club history, guiding them to an OHL Championship in 2017. Ellis records 200th NHL point: Windsor Spitfires graduate Ryan Ellis recorded his 200th career NHL point in Sunday’s 5-4 loss to the St. Louis Blues. The Nashville Predators defender has 28 points (6-22–28) over 58 games this season. A 28-year-old from Freelton, Ont., Ellis enjoyed a prolific OHL career with the Windsor Spitfires from 2007-11, guiding the franchise to a pair of Memorial Cup titles while being named a two-time OHL Defenceman of the Year. Over his four OHL seasons, Ellis recorded 313 points (73-240–313) in 226 regular season games. He was a first round pick of the Predators back in 2009. Labanc records first NHL hat-trick: Barrie Colts graduate Kevin Labanc netted his first career NHL hat-trick on Saturday, powering the San Jose Sharks past the Edmonton Oilers 5-2. The 23-year-old from Staten Island, NY has 37 points (10-27–37) over 57 games in this, his third NHL season. Labanc is a former back-to-back 100-point scorer and OHL Overage Player of the Year, racking up 269 points (81-188–269) over 198 career regular season games with the Colts from 2013-16. He was San Jose’s sixth round pick in 2014. Mangiapane scores first NHL goal: Another Barrie Colts grad and back-to-back 100-point scorer, Andrew Mangiapane scored his first NHL goal on Saturday as the Calgary Flames 4-3 in a shootout to the Vancouver Canucks. Mangiapane has three points (1-2–3) over 17 NHL games this season while also registering 17 points (9-8–17) over 15 games with the AHL’s Stockton Heat. The Bolton, Ont. native played three seasons in Barrie after making the team as an undrafted free agent, recording 261 points (118-143–261) over 195 career regular season games from 2013-16. Mangiapane was Calgary’s sixth round pick in 2015. Wilson scores first NHL goal: It was a long time coming, but Owen Sound Attack graduate Garrett Wilson scored his first NHL goal on Saturday as the Pittsburgh Penguins fell to the Tampa Bay Lightning 5-4. The 27-year-old from Elmvale, Ont. made his NHL debut in 2013-14 and managed to score in his 61st career regular season game. Wilson has six points (1-5–6) over 27 games with Pittsburgh this season while serving as captain of the AHL’s Wilkes-Barre/Scranton Penguins where he has 18 points (8-10–18) in as many games. Wilson has played in 362 career AHL regular season games, putting up 185 points (84-101–185) in the process. Florida’s fourth round pick in 2009, Wilson led the Attack to an OHL Championship in 2011 as a First Team All-Star. He recorded 184 points (94-90–184) over 191 OHL regular season games between Windsor and Owen Sound from 2007-11. Cernak sores first NHL goal: Erie Otters graduate Erik Cernak scored his first NHL goal on Feb. 2nd and followed it with another this past Saturday. The 21-year-old Slovakia blueliner is off to a great start in the NHL, recording nine points (2-7–9) and a plus-14 rating over 34 games with the Tampa Bay Lightning. 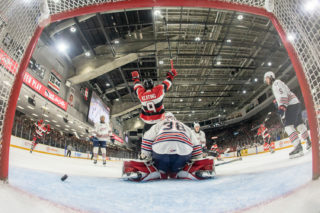 An OHL champion with Erie in 2017, Cernak played two seasons in the Flagship City, recording 36 points (7-29–36) over 91 regular season games. He was originally Los Angeles’ second round pick in 2015 before being dealt to Tampa Bay in a trade that included goaltender Ben Bishop in 2017. Siebenaler dealt to Penguins: Niagara IceDogs graduate Blake Siebenaler has been traded from the Columbus Blue Jackets to the Pittsburgh Penguins. The 22-year-old from Fort Wayne, Ind. appeared in 17 games with the AHL’s Cleveland Monsters this season, recording two points (1-1–2). Siebenaler is in his third season with Columbus’ AHL affiliate and was acquired for a conditional 2019 draft pick. The right-shot defenceman played three seasons in Niagara, recording 96 points (25-74–96) over 199 regular season games. He was Columbus’ third round pick in 2014. Boudreau coaches 900th NHL game: OHL graduate Bruce Boudreau coached his 900th career NHL contest on Saturday. The Minnesota Wild bench boss, Boudreau leads active coaches in points and winning percentage. He is the ninth active NHL coach and the 35th all-time to reach the 900-game mark on his career. A former back-to-back 100-point scorer who won a pair of Memorial Cup titles with the Toronto Marlboros, Boudreau still holds the Memorial Cup single game record with five goals set in 1975. The 64-year-old has been a head coach in the NHL since 2008, serving stints in Washington, Anaheim and Minnesota. Eakins earns 300th AHL victory: Peterborough Petes graduate Dallas Eakins earned his 300th career AHL coaching victory on Friday. Eakins is in his fourth season behind the bench with the AHL’s San Diego Gulls. He also served as head coach of the Toronto Marlies from 2009-13 before a year-and-a-half as head coach of the NHL’s Edmonton Oilers. Eakins played a lengthy minor pro career that included 120 NHL contests after four years in Peterborough from 1984-88. The former Petes captain recorded 82 points (20-62–82) over 226 career OHL games. The Peterborough Petes and Hamilton Bulldogs enter the weekend tied for sixth place in the Eastern Conference, each with 53 points on the season. The Petes hit the ice with two games in hand on the Bulldogs, taking on the Barrie Colts on Thursday before the Bulldogs come to town on Saturday night. The Petes have had consistent recent contributions from midseason acquisition Ryan Merkley who has 20 points (5-15–20) in as many games in maroon. 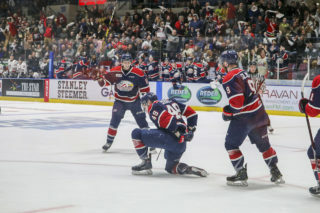 Bulldogs captain Matthew Strome is riding a 10-game point streak while top 2019 NHL Draft prospect Arthur Kaliyev leads the team with 42 goals and 83 points. The Petes and Bulldogs wrap up their season series on Saturday. Hamilton won the first three meetings of the season before the Petes responded with three straight victories of their own. It’s a Central Division showdown on Sunday in Niagara as the IceDogs look to reverse a recent spell of losses at home to a hungry Sudbury Wolves club. The Dogs had a tough weekend on the road in Sault Ste. Marie and Sudbury last weekend and look to avenge Sunday’s 3-2 loss to the Wolves. Dallas Stars prospect Jason Robertson enters the weekend 12 points shy of 300 on his OHL career, leading the IceDogs with 88 points (39-49–88) on the season. Ben Jones and Kirill Maksimov join Robertson as Niagara’s three 30-goal scorers on the campaign. Things have come together nicely for Sudbury as the Wolves ride an eight-game winning streak into Friday. Buffalo Sabres prospect Ukko-Pekka Luukkonen has been among the OHL’s top goaltenders, leading the league with five shutouts. Deadline addition Adam Ruzicka is on a current eight game point streak and has 16 points (9-7–16) over 14 games in a Wolves uniform. Sudbury has won three of four against Niagara this season with two meetings left on the regular season schedule.